Saturday the 1st of July marked the 1st birthday of Geelong Boxing and Obstacle Training’s facility “The Funhouse”. 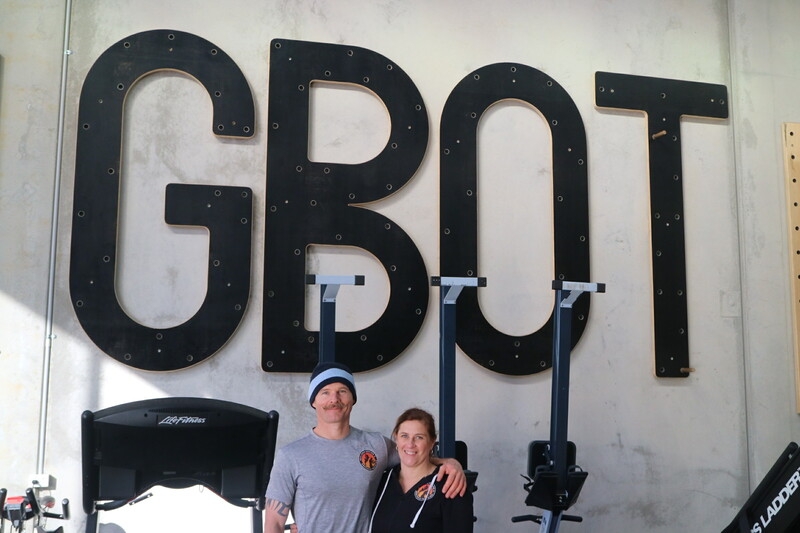 To celebrate this event Jase and Karen Lydom and their team of talented trainers decided to put on a sampling of $5 classes showing the variety of what they have to offer. 30 brave souls apparently showed up at 6am for a session which Jase lovingly has titled “Harden the f**k up”. This is an hour of some of the hardest exercises you’ll ever do and to make it even harder today they had to survive 0 degree temperatures. 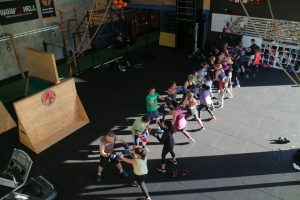 After this there was a METAFIT class as well as a Circuit class (which was hosted by trainer Clint Allen), which if the pictures I’ve seen are anything to go by was an hour of incredibly hard work. Cupcakes and obstacles… what more could you ask for? mething to push towards. Not many group fitness classes anywhere would have you running up the warped wall, swinging on monkey bars and scaling cargo nets over the hour duration, so you get a great functional workout. It’s worth mentioning too that all of the GBOT trainers not involved in the class were floating around and helping everyone with form and positive reinforcement. 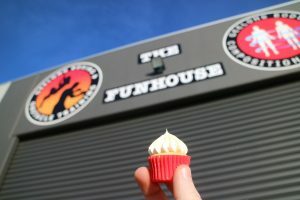 At the end of the workout, everyone was offered a very special not healthy cupcake to celebrate the birthday. 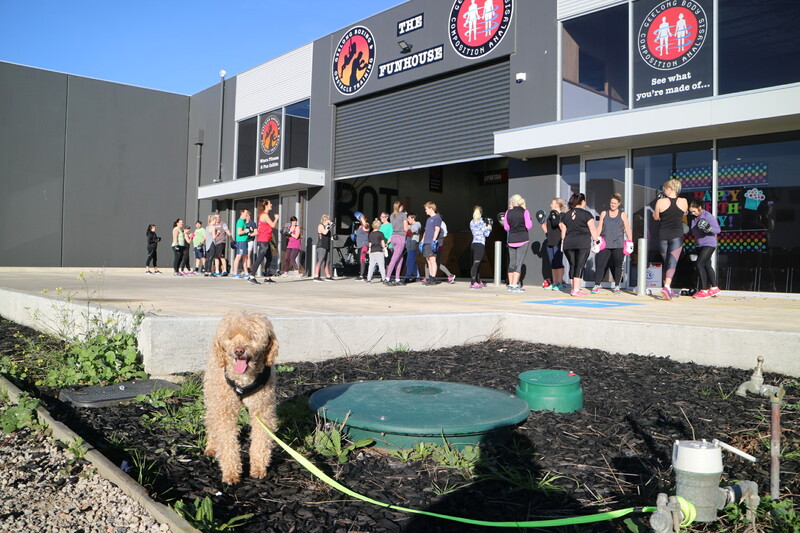 After obstacle training, another 30-odd Saturday morning Warriors lined up for Bree’s boxing class. We did not partake in this class because our forearms were on fire from the hour of obstacles in the previous hour. So in this time we watched the class work up a sweat with a flurry of punches that seemed to never let up. Even dogs like the classes at GBOT! 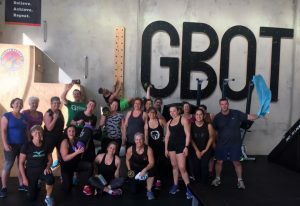 During the boxing class we also had the chance to play on all of the Ninja Warrior obstacles that GBOT has to offer. This meant spending time on the salmon ladder, spider climb, wall traverse, lache bars and ring toss. It’s honestly amazing how many obstacles they can fit into this space and still have enough floor space to run classes. We were also lucky enough to meet a man named Rick who is going to be on Australian Ninja Warrior on the 11th of July. Look out for his run because of the way he performed on these obstacles is any indication he has the ability to go far. After this hour of ‘rest’ it was time for our first experience of MetaPWR run by Jase. This was an intense 24 minute circuit class involving 10 different exercises in 3 rounds with occasional injections of 3 core exercises. 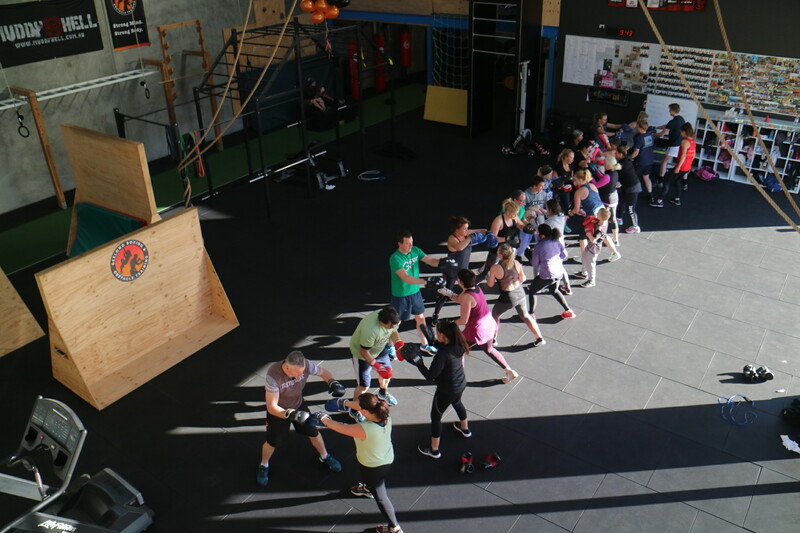 Although many people training for ninja warrior wouldn’t think that completing a group fitness class could help them achieve their goals, trust me this class will build your capacity to work at a high intensity non stop. After this class it actually took a good 30 minutes for my heart rate to fully slow down. If you’d like to see just how this looks check out the time lapse video of the class at the end of this post. Lastly, Nat was holding a Yoga class to fully round out the vast array of classes on offer. Even though we participate, it wasn’t pretty relaxing just to be around. Nat’s yoga class to end the 1st birthday celebrations. What sets GBOT apart from other training centres? My wife and I, wanted to set up “The Funhouse”, as a class based facility. It is not any ordinary gym, where you can just pop in anytime and train. We want clients to train hard, leave and then be itching to get back in, for another class. This concept, allows us to monitor our clients during classes and cater to their specific fitness levels and abilities. Our custom made obstacles also help set us apart from other training facilities. 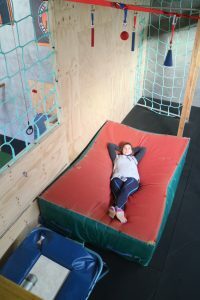 We aim, to add to our set up, with new obstacles, every 3-6 months, to keep up to date, with the ever evolving Ninja Warrior environment. You’ve competed in obstacle races all around Australia as well as World’s Toughest Mudder in Vegas… what is your favourite race to run and your favourite obstacle? I have been lucky, to have competed in the 24 Hour World’s Toughest Mudder 4 times and it would be my favourite race of all time. The Rat Race, in the UK comes a very close second but WTM is a physical & mental challenge of epic proportions. Racing for 24 hours is brutal. The innovative obstacles, always test your capabilities and my favourite would have to be the “King Of Swingers”. To complete this particular obstacle, you leap upwards/forwards from a 5 metre high platform and grab a rigid, metal handle that then swings you forward to a waiting bell, that you have to hit, before letting go and plunging into the water below. To hit the bell, you must time everything perfectly. Your jump, the swing and the dismount. The very first year we tried “King of Swingers”, it was tough. If you missed the bell, a penalty run followed. (Tough Mudder currently have a slightly modified version, of “King of Swingers”, in their races). You have a few alter egos you like to use from time to time. How did these come about? I do. Currently doing the rounds are Bruce Sooperstar, Sugar Spunkalicious and Macca the bogan. Another will be unleashed very shortly….Yin Yang the Yoga Instructor. The first alter ego happened by accident. I was running my Bootcamp, wanted a night off for an appointment and had organised a fill in instructor, to take the class. Unfortunately the instructor called at the last minute and could not take the class. I had promised my Bootcampers a “mystery” instructor, so I had 2 choices: Cancel the session or cancel my appointment. I cancelled my appointment and decided to dress up as a “mystery” instructor. I found an afro wig and some colourful clothing at home and Bruce Sooperstar was born! The other characters are purely for my own amusement. If anyone else gets a laugh out of them, then that is a bonus. I don’t take too many things seriously and I try to use humour, where possible. What hints can you give about up and coming events and obstacles at GBOT? We have some exciting things planned for 2018, involving the community of Geelong……but we cannot reveal too much just yet. However, we can reveal that, in August, we will be starting Ninja Warrior classes, using various Ninja Warrior competitors from the show, as coaches. On top of this, we have the scope to run “Mini Ninja” classes for kids, too. We also have Commando Steve hosting 2 training sessions for us, in September. As far as new obstacles, we are currently working on Interchangeable Balance Beams, a Puzzle Peg Board, a Rope Traverse and a Tilting Balance Beam. We are always open to new ideas though, so we often ask our members/Ninja friends for suggestions. How do you put together all of these classes you run? There’s so much variety that it must be hard to keep things fresh and exciting for your clients. I have been instructing fitness classes for 12 years now and planning sessions has always come easy to me. I suppose I have a good imagination and creativity has always been a strong point. A normal week for me involves instructing at least 22 classes, at GBOT. I try to put variety into the sessions, to help keep everyone motivated and to help build the GBOT community. Team workouts build client rapport and putting games into the sessions, breaks up the monotony of training. Our motto is “Where Fitness & Fun Collide”, so I try and stick to that. What key advice would you give any aspiring obstacle racers or ninjas? Do it. Get out there and have a crack. Surround yourself with like minded people. Embed yourself in a great training community. Work on your fitness but also your skills. 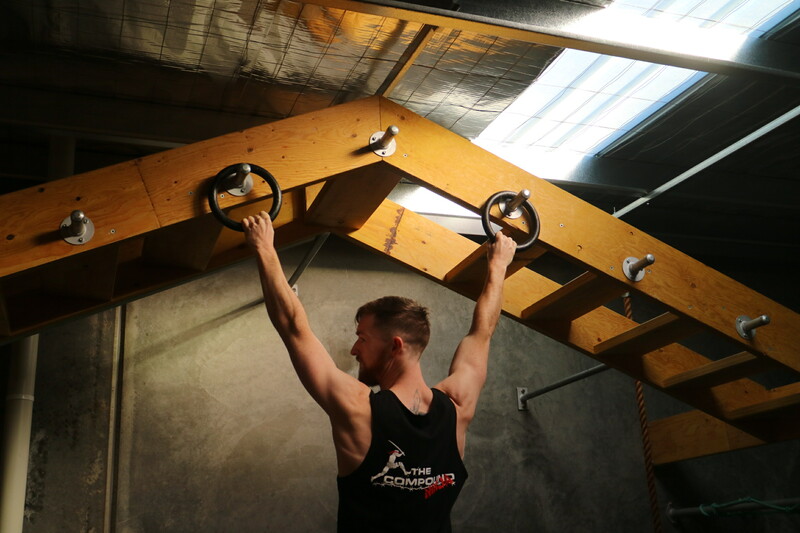 Grip strength, core strength, upper body strength are crucial in OCR and Ninja. Calisthenics is a perfect fit. Be careful not to over-train though. Elbow/shoulder injuries are common when training on obstacles and you do need to balance out those “pulling” and “gripping” actions, with the same amount of “pushing” actions. Implement Yoga or stretching into your regime. Your body will appreciate it. Lastly, have fun. Life was not meant to be so serious. ← Ninjas In Training : K9 Ninja!